In the “Big Splat” theory, a Mars-sized celestial body collided with Earth more than three billion years ago. 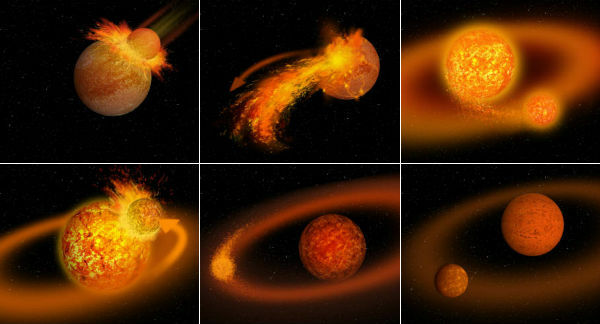 The two planets merged together to form the Earth as we know it, while the raw fragments of material for the formation of the moon were flung into space. This theory is considered practical because the Moon, like Earth, has an iron core. However, one would still expect the composition of both bodies to be distinctly different considering the fact that the moon would be composed of the materials from not one planet, but two different ones. Instead of that being the case, when astronomers compared moon rock samples, to those gathered on Earth, they learned that the oxygen isotopes ratio in both samples were nearly identical. Additionally, both objects share a similar isotope ratio of titanium (although there appears to be some kind of uncertainty about the percentage of other refractory elements). The findings that the silicate materials from both sources have similar isotopic signatures hint that the two objects were formed from the same materials. Now, a variation of the “Big Splat” theory has been presented by astrophysicists from the Center for Space and Habitability in Switzerland. In their model, Theia is replaced with a much larger planet that was traveling at speeds that far exceeded that of Theia. Instead of colliding and merging together, this culprit was likely involved in a high speed hit and run collision with our home planet. During the cataclysmic event, the Earth was forever changed, having had a significant portion of its mass expelled into space, while the other planet was only slightly affected. The lingering materials then gradually formed a glowing ring of molten material. Over the course of several millions of years, the ring of debris that once encircled the planet coalesced into our beloved moon. Previously, this theory was dispelled because it was difficult to produce accurate simulations without having the proper data for the starting points. Including (but not limited to): the angular movement of the approaching object; the impact angle of the collision; the mass of both the proto-Earth and its assaulter; as well as the speed of the approaching object. As to a definitive answer to this question, we may never know. However, It’s undeniable that this latest theory fits the collected data better than any of its predecessors do. Pinpointing the impact debris that managed to escape Earth’s powerful gravity could provide the clues needed to reaffirm the modified theory. The spectral signature of the composition of the debris could provide all of the proof we’d ever need. Of course, that’s easier said than done. Read the full paper, “The proto-Earth as a significant source of lunar material.” Or, check out our article, “A Rocky Relationship: Is the Moon Leaving the Earth,” about the Moon receding from Earth. What would Pangea look like with Current Geopolitical Borders?